It’s an early afternoon in August. My palms are sweating slightly. I’m holding my cards tight. It’s going to have to come down to this play. I look up at the two people across from me and lay down the first card. Two months earlier I had bumped into Will Hindmarch at Origins. With some liberal cajoling I managed to eke out a promise that he would run his super secret game-in-development Project: Dark for myself and a few others. Having followed Will on social media I knew he was as big a fan of stealth-genre games like Thief and Dishonored as I am. From having played a few RPGs he’d designed I expected that the game would be fun, clever and easy to pick up. I wasn’t disappointed. 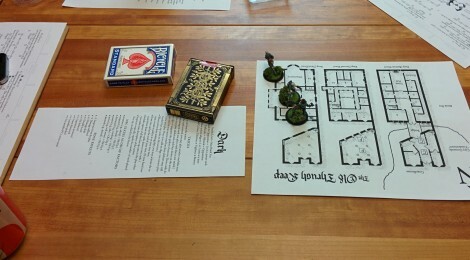 We had a great time, but afterwards when discussing the playtest I pointed out that it felt like we were ahead of the curve – master thieves in an adventure wet-behind-the-ears thieves could probably navigate. Will smiled and agreed, pointing out that this was an intro adventure designed to teach the game rather than push the limits of the thieves present. Being a stealth-game aficionado I asked him to run a more serious and difficult game for me at some point. We gather in John LeBoeuf-Little’s room, discussing the system and crafting our characters. John makes a social savvy, guile-strong thief (Crawford sheet pregen for those following the Project Dark Kickstarter: http://kck.st/1o8C4Xd). He’s got wild, dirty-blond hair, a quick smile, and knows art, history, and the social landscape of the city. “Rook,” John says by way of character introduction. “Like the chess piece?” I ask. “Like the bird,” he says. He’s the sort of thief that can pass for noble when he cleans up, and you bring on the job because he’ll double your take by knowing exactly what everything is worth. More a lover than a fighter, with a quick smile and quicker fingers. I’m playing a Clubs-Spades build, meaning my thief is the muscle. Short on social graces and clever tricks, he’s very physical and built for strength and speed. He’s brought to scale walls and drop the rope, and for those times when things go wrong and someone has to put down the guards quickly and with a minimum of noise. I didn’t want to just make him brutish though, so I add some flavor with a liberal dash of Arcana, Religion and some Ranger skills, giving him a cat familiar. We describe details, smile, and look at Will. He explains he’ll run a quick intro scene to get us used to the game before we do the casing of the joint and an actual mission. Oh, I think to myself. Will took that ‘make it challenging’ bit seriously. I look at my fellow thieves nodding at the full squad, “We’ll meet at the Drunk Pig. Best of luck gents.” And with that I’m heading for a window and Maliq and his cat are leaping, skimming vines, and clambering down to ground level. I use a bit of Traverse (a skill that lets you clamber up and down elevation without needing a play). “Wait,” calls out Rook. He has rope in his inventory which he pulls out and uses, making the difficulty to scale much lower. “I’m scaling the wall,” John tells Will. This is the first time we’re seeing how to make a play this game. “That sounds like you’re using some strength to clamber, so Clubs are suited.” “Also I’m trying to do it quickly and with whatever agility I can muster, so I’m calling Spades.” Saying something is suited to the task means that playing a card of the appropriate suit doesn’t stop the play. John drops enough cards to cover his climb and Rook chases after Maliq. “What do you suggest?” Maliq asks. “Catacombs. Through the family graveyard. Back of the church.” He’s running. “You’ve been in these catacombs?” Maliq asks, already running after him. “I have a map,” he calls out over his shoulder. We find a tomb and a way down. The City on the Saturnine has grown and shrunk over the ages, entire sections rebuilt over previous ones. There are cities beneath cities. The catacombs aren’t just for the family plot but criss-cross all throughout the High Hill with the finer estates. It’s dark, but the entrance we used isn’t the only one. There are grates leading up for ventilation. We hear the guards above us. At one point there are footsteps and one of our friends creates a brief shadow as he’s dashing for escape above us. There’s a twang and we hear a thud atop a grate up ahead. By the time we get there, there is blood dripping between the bars. Rook’s about to see if there’s anything we can do when the guard’s lanterns shine down. I pull him back, Maliq’s eyes reflecting the lantern’s glow just like his cat’s. We edge along the wall, trying to stick to the shadows and not make noise. I had drawn into a weak hand so it took me four cards to get by. The guards test against our stealth. Will rolls for them, looking to see if he can beat our ‘stealth’ represented by the number of cards in-hand. I had just used up a number, and they catch a glimpse of Maliq’s outfit as he goes dashing after Rook further into the catacombs. We pour on what speed we can in the murk. Further in, the sounds of pursuit catching up behind us, Rook suddenly stops. John shows Will a card and points at his sheet. Will grins. “Work with me?” John asks him, smiling. “So,” says Will, taking over describing the scene. There’s an over-large door, carved in bas relief. This is not Maliq’s religion but he recognizes seals and wards when he sees them. His cat hisses at the door. “I don’t like this,” Maliq says. “We should go.” The door sweats lightly as if the other side is far colder than the corridor we’re in, and it’s deep underground. Maliq looks at him eyes flat. “The river, huh?” They haven’t walked that far underground. Not by a long shot. Maliq knows he’s lying, but the guard lanterns are coming up behind them. They only have a minute at most before they’re found. The only exits he knows lead up for sure require him to go through the guards. The other option is to go deeper into the catacombs, waiting in the dark, hoping he can find his way back without light. I look at my hand of cards. It’s well suited to combat, but those guards have crossbows and large weapons. Any combat is risky, plus I’d be charging them from the front. They’d see me and I’d have to kill them, which would make the Inspector that much more dogged. Rook is charming. Maliq might not believe him, but he knows his partner isn’t suicidal. How bad can it be? “All right. Let’s do it.” I reach for the door, ready to pull the stone thing open, ready to fight wards and mystic seals, but it opens on it’s own. The darkness inside seems to eat our light. My cat hisses again. Rook thrusts his lantern forward and it dims. Maliq hears a sussurance in that void beyond the doorway. Rook takes a step and Maliq puts a hand to his shoulder. There’s another noise in that darkness again. His cat won’t go in on it’s own, but Maliq scoops it up, and puts it in his hood. It growls softly. He crosses the threshold and looks for the nearest thing to hide behind. Maliq scampers up a column, hiding in the arched ceilings, waiting to pounce down on the guards that should be coming through any second. Rook is moving further in, but he hoods the lantern completely. The guards roll up on the door and pause. “Oy, Tull, you reckon they went in ‘ere,” one of them asks. “I ain’t goin’ in there!” protests the first. They retreat. I’m relaxing my death grip on my cards when Rook steps further in and torches ignite with blue fire. It’s a tomb. I swallow slowly, but Rook is eyeing up a sarcophagus greedily. I realize why he’s been pushing to get here. Rook’s player probably has a killer hand for looting, and is trying to turn this bust of a run into something we can walk away with a heavy pile of treasure from. He steps forward and reaches for the lid, and we see what was making the sussurance that I heard earlier. Two skeletons, robed richly, animate fully. Translucent blue flesh and ghostly musculature visible beneath surround them. Spectral Guardians. I tense. Rook draws a blade. He tries to stick one but the blade passes through that glowing flesh like it wasn’t there. I realize he’s in trouble. A killer hand for looting isn’t a killer hand for combat. His player smiles meekly. The Guardian’s eyes start smoking, he starts running, screaming for help. Stone, vases, and tomb treasure start disintegrating beneath the guardians gaze. Sure enough, when making the play to dodge John only drops a single card, Rook gets clipped, and goes stumbling up to a pillar, putting his back to it, covering his head, bleeding profusely, leg in bad shape. I look at my hand. Rook cannot take any more damage and live. I have a better hand for combat, but all combat is deadly. After a round of going toe-to-toe with Guardians I’ll be in similar shape – unable to fight. My only hope is that the hand is good enough to end this now. My palms are sweating. Time to see what I can do. “Sure, I’ll say Guile for spellcraft, so Diamonds are suited. The difficulty will probably be high too.” I don’t have any diamonds in hand, but I have a plan. “I say Clubs for force, because I’ll be rending them apart once my spell works.” My hand is mostly clubs anyway. I flip over my first card. A Jack of Clubs. This is a Brutal Jack giving me +1 damage. It counts as a five, and it’s Quick meaning I draw another card. It’s a diamond. I breathe a sigh of relief. “I clinch my hood so my cat doesn’t fall out, and drop from the archway.” I say. I lay down my four of diamonds and narrate what my character does. Four cards left in my hand. Some of these I know will be edges. If you succeed you can improve your action by playing cards face-down. But only if you beat the difficulty first. Nine is pretty good. I’m not sure if it’s good enough, but playing another card means not having an Edge to boost my damage. But missing the difficulty means not having my edges count for anything. And dumping my hand means not having enough cards to try this again next round. It’s all or nothing. The other two people in the room are quiet letting me think it through. I’m holding my cards tight. It’s going to have to come down to this play. I decide to risk it. I snap the cards down one by one creating edges, and flip my trump play over. “Takedown King,” I say pointing at the last card. “When played as an edge gives me my combat rating in damage spread how I like to targets in reach. I’m going to put all of it on the second guardian, and focus my damage on the first. The other edges are to reduce incoming damage.” I look at Will waiting to hear if my gambit works. “Tell me what that looks like,” he says and I breathe a sigh of relief. Maliq springs into action. His fist punches through a rib into the chest cavity of a guardian, ripping out the jewel bearing the spell that animates it. He turns to the next and his hands swing fingers held as if there were claws at the ends of them. Each blurring motion ends in a shot to the skull to keep those smoldering eye sockets from lining up with him. After a few hits his last punch goes into this one’s chest cavity and emerges with the remaining animating jewel. Where his limbs intersect the blue ghostly energy of the guardians his spell form is revealed, the spectral residue revealing leonine features, and clawed paws superimposed over his body. The guardians bones fall to the ground, and turn to dust as if centuries of decomposition hit them at once. Maliq drops the animation stones and runs over to Rook who is clutching his leg and smiling through tears. “No,” Rook says. “I paid in blood for this treasure. I’m taking what’s in that sarcophagus.” Sure enough he has a hand perfectly suited for looting, including a key card (Expert Fence) that uses his knowledge of History and Art to make this a mighty haul. Since treasure converts directly to experience, this is a huge leg up for both of us. We get to wrapping up goods and taking what we can. Rook looks at the body of some ancient sorcerer in the sarcophagus, eyes inset with jewels. He reaches down and pries them out, putting them in a pouch. We make our way out. We laugh, but there was no stopping. I won’t regale you with the details of a caper of a greedy merchant-noble and how he found something ancient he shouldn’t have touched. Or how we relieved him of his possessions, and left him to the tender mercies of his find – because there’s a good chance you may see this adventure yourself some day. But what I will say is this, it was dangerous. It was tense. But I loved every minute of it and can’t wait to follow the future escapades of Rook and Maliq. Stealth action is a genre that hasn’t actually been explored very deeply in RPGs, and Project: Dark is a bold new step and a really slick implementation of it. I’m really glad to finally see an implementation that actually makes me feel the thrills and tension I’ve seen in similar games on consoles and the PC. This sounds just like our play test sessions! Thanks for sharing them with the rest of us backers! Happy to share marty! I’m glad to hear we’ve had similar experiences. ^_^ It’s a good sign that the game performs consistently across different groups.